Post operation physical therapy and rehabilitation are critical to recovery success. Surgery is used to make repairs to parts of the body. With those repairs, comes the need to readjust and retrain your body. The opportunity to get healthy and return to action is one that takes time, dedication, and hard work. Athletes who want to return to competition or just regular people who simply want to be active have a big role to play on the road to recovery. Passaic County physical therapy specialists at Elite Spine and Sports Care are dedicated to getting you back in action after your surgery! When does post-operation physical therapy start? Typically pretty quickly. This can be as little as a few hours to a few days after surgery. Of course, this is dependant on your specific injury and surgery. For instance: Immediately after waking up from a knee replacement surgery, you will be transferred to a qualified rehabilitation center to begin your recovery, whereas, after surgery on a broken bone, you may be required to keep it immobilized. This will push the rehabilitation phase forward a few weeks. Is there anything you can do to prepare for post operation physical therapy? What can you expect from post operation physical therapy and rehabilitation? Your NJ physical therapist will design a comprehensive rehabilitation protocol. This plan is individually designed to focus on the area where the surgery occurred. This includes promoting healing, reducing swelling, and addressing pain while focusing on joint mobility, flexibility, and increasing strength. The program that is in place will adjust as you recuperate. Initial physical therapy and rehabilitation will focus on healing and preparing for the hard work ahead. You play a big role in your recovery! Focus and determination play a large role in your recovery. This means committing to the plan that your physical therapist puts in place. Regaining strength and mobility is largely up to you. Understanding how far you can push yourself and how much you need to do is essential. If you commit to your program there is no reason you cannot be back in action and ready to pursue an active lifestyle when your body is ready! 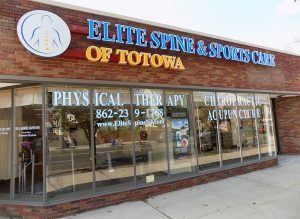 Contact our team at Elite Spine & Sports Care of Totowa today to learn more about NJ physical therapy options and what to expect when facing surgery. We welcome the opportunity to answer all of your questions while helping you on your road to recovery. Let our knowledge and experience will get you back in action and feeling strong through post operation physical therapy and rehabilitation.